For over 35 years Bill Harvey has been leading the way in media research with special emphasis on the New Media. He is often asked to provide his vision of the future of some specific part of the media world. Bill is known to many as a media futurist. Bill Harvey after a history of innovation co-founded TRA, the first company to show that naturally occurring purchase and media data can be used to create the first actionable process for true ROI measurement and optimization. In 2012 TiVo acquired TRA, now called TiVo Research. Discovery of the 265 drivers of viewing, accounts for 76% of the information in Nielsen ratings. Ability to grow the sales of stalled brands. Bill has spent over 35 years leading the way in media research with special emphasis on the New Media. As the 24 year-old strategy head of the American Research Bureau (now Arbitron), he invented the Area of Dominant Influence or ADI, an audience-based definition of television markets that Nielsen emulated as the DMA, and which was called by Sales & Marketing Magazine “the most widely used marketing tool in the world today”. The ADI has profoundly influenced the advertising and television industries. Harvey benefited from entering the advertising business exactly as the first mainframe computers were being turned to the task of media optimization. This led him to become one of the early pioneers of optimizers — and a media researcher who had to also learn about media effectiveness in order to program the optimizers. Media effectiveness as a subject falls between media research and advertising research and so Harvey was one of the few media researchers who crossed the line to combine both disciplines. He was most fortunate to have been tutored and mentored by some of the giants in the advertising and research industries including Mike Drexler, Erwin Ephron, Helen Johnston, Timothy Joyce, Burt Manning, Len Matthews, Hal Miller, Ed Papazian, Sandy Reisenbach, Jim Rosenfield, Arnie Semsky, Lester Wunderman, and too many others to mention here. Before joining Arbitron, Harvey was a media research executive at Grey Advertising, Kenyon & Eckhardt, and Interpublic, specializing in the development of media optimizers. Bill authored Mind Magic, a book on self-transformation, which has been used as a course text at thirty-four universities including NYU and UCLA. A popular speaker at media and futurist conferences around the world, he has written and been the subject of numerous articles in a wide range of consumer and media trade publications. From 1979 to 1999 his monthly newsletter, The Marketing Pulse, helped decision-makers at leading advertisers, agencies and media companies understand important trends in media technology. That newsletter in 1979 accurately predicted the 3-network share of audience as it would be in 1990, and made many other projections that turned out to be prophetic, including predicting permission marketing, and coining terms that became generic such as clickstream and clickthroughs. In January 1999 that newsletter merged into The Myers Report. In 1972, Harvey founded New Electronic Media Science (NEMS), a marketing media research consultancy that has served nearly 70 top advertisers and agencies, all major MSOs, virtually all major networks and all major Hollywood studios in the area of New Media. NEMS consulted for QUBE and numerous other early trials, for AT&T in the development of the 900 Number, had its first online service in 1972 and put the first online questionnaire on CompuServe for World Book in 1982. NEMS created International Research Services (IRS), which worked with research companies in 34 countries and compiled and harmonized ratings data from these countries into comprehensive reports for a number of Hollywood studios and networks. NEMS had clients in the U.S., Canada, U.K., France, Germany, Italy, Spain, The Netherlands, Japan, Australia, and a number of other countries. In conjunction with IBM and Leonard Matthews, former CEO of Y&R and of Leo Burnett, Harvey founded Next Century Media (NCM). Next Century Media began as the leading interactive media advisor to advertisers, advertising agencies, entertainment and media companies worldwide, and evolved into an enabler and service provider for addressable TV commercials and TV clickstream measurement. NCM led the development of addressable television advertising and interactive media measurement Standards, working with the ANA, 4A’s, ARF, IAB, FAST, Audit Bureau, NACHO, CableLabs, and CASIE. Harvey was the originator and drafter of the CASIE Principles which set the privacy standards for the industry. In 1995, in cooperation with Arbitron, NCM published The CyberMeasurement Index, the first compilation of Internet clickstreams to a common Standard, in which AOL was a leading participant; 34 agencies subscribed to the report. This was the first experiment in the amalgamation of clickstream data from multiple sources. NEMS and NCM were leaders in the field of Media Effectiveness Measurement, the quantification of the higher order business effects of one medium versus another. Harvey believes that this is the Holy Grail within the marketing business: the ability to place an ROI value and not just an eyeballs value on a specific advertising investment. In the 70s, NEMS was highly active in this field, and among the notable studies conducted in that era was the measurement of a CBS Special sponsored by Ralston Purina, whose attitude shift and commercial recall scores tripled their scatterplan norms, and the measurement of the same ads in Black Enterprise Magazine versus Newsweek, showing again three times the effectiveness for an average ad among upscale Blacks if the ad were seen in the context of their own specialized magazine. Bill worked with Dr. Daniel Goleman (Emotional Intelligence) and Dr. Richard Davidson, today one of the top neuroscientists in the world, on the application of brainwave measurements to determining the effectiveness of advertising and media. NCM provided a number of clients with media effectiveness research studies, the best known of which are the Sponsorship Effectiveness Index (SEI), and the Commercial Retention studies conducted with cable operators. SEI established the power of native content earlier than any other research system. 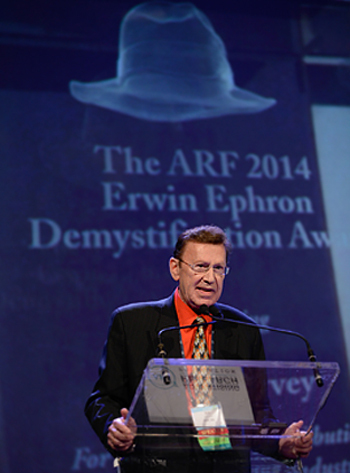 Harvey was founder and chairman of the New Media Model Committee of the Media Accountability Council for the Advertising Research Foundation, whose work achieved industry and ARF approval as the new ARF Media Model published in 2003, with tremendous leadership from Erwin Ephron, whom Bill invited to join as co-chair early on. NEMS and Harvey were active in the development of digital out of home. In the late 80s, NEMS was the quarterback of a multi-studio study of the feasibility of deploying giant TV or computer screens in malls and other public places primarily supported by the motion picture industry marketing budgets. NEMS was also involved in numerous other research studies involving digital out of home in the U.S. and Europe. Next Century Media conducted studies of several important digital out of home media including mall video advertising for AdSpace, digital taxitop advertising for AdaptMedia, and others. NCM consulted for such industry leaders as Microsoft and Amazon, and consulted on the development of websites for such companies as GM, Visa, Pepsi, Nissan, and many others, and for the clients of agencies such as BBDO, TBWA Chiat/Day, and Messner. Harvey was the Keynote Speaker at the first meeting of the Internet Advertising Bureau, and the speaker representing the advertising industry at the first WorldWideWeb Consortium Measurement Conference. At that conference, Harvey proposed the universal ID that Facebook and others are now achieving. NCM invented and patented a system for making TV commercials targetable down to the individual home and person, which spawned an entire field with multiple companies competing to supply these important new advertising units. NCM produced reports from the Interactive Index, a service for certifying and compiling the immense “clickstream” (potentially every button push on remote control channel changers and PC keyboards) databases of interactive media worldwide, in cooperation with top research companies such as Nielsen and Arbitron. General Motors was the first subscriber to the Interactive Index, which received letters of support from most of the top 20 agencies. 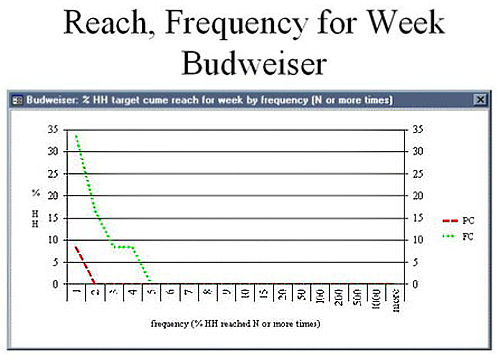 Addressable Commercials increase reach and frequency against targets at same cost. Through those two companies, Harvey has been involved in every major New Electronic Media trial in the United States since 1975 and many other trials around the world. He brought more advertisers and agencies into more Interactive TV trials than everyone else in the world combined. During 2003-2004 Harvey took a sabbatical from Next Century Media and from Bill Harvey Consulting to accept the role of Senior Vice President and General Manager of OpenTV Research, a new unit he conceived for OpenTV — at that time a Liberty Media Company with a national deployment of 7 million US homes with interactive TV advertising and set top box data (DirecTV + Charter). As GM he generated the reports of the landmark Aurora trial of SpotOn addressable commercials for Comcast, Coca-Cola, General Motors, Home Depot, Johnson & Johnson, and the U.S. Army, and began to develop the idea for TRA. TRA was created to fill the need for a way to make singlesource research economically scalable and sustainable. Singlesource — the tracking of both media and ad exposures plus purchases in the same sample over time — had been created but kept going out of business (Milwaukee Ad Lab, Adtel, ERIM, ScanAmerica, Apollo). TRA was the way to do it, using naturally occurring data at scale by connecting set top box data and digital clickstream data to purchase data at the same-household level. This breakthrough quickly became widely copied and is today the major paradigm for the top digital companies. TiVo acquired TRA in 2012 and it is today called TiVo Research. Bill is its Strategic Advisor. RMT has exclusively licensed IP from NCM and also from Bill Harvey Consulting and is now serving major customers in both ROI and content, achieving positive cash flow in its first year. So far the greatest excitement created by RMT is around DriverTags™, the 265 metatags discovered by NCM and now exclusively licensed to RMT, which are the subconscious driving forces behind why a viewer selects this program rather than that one. Validated by set top box data, Nielsen data, renewal vs. cancellation of series, and Hollywood creatives, DTags™ predict 76% of the variance in Nielsen ratings. Bill’s vision is to use this technology to drive higher yield for content in a number of ways. And to provide a platform the industry can use to holistically maximize ROI on advertising in concert with all industry data and capabilities. Bill’s peers recognized him with the Great Mind Award in 2008 to celebrate his achievements. In June 2014, Bill became the first recipient of the Advertising Research Foundation’s Erwin Ephron Demystification Award.